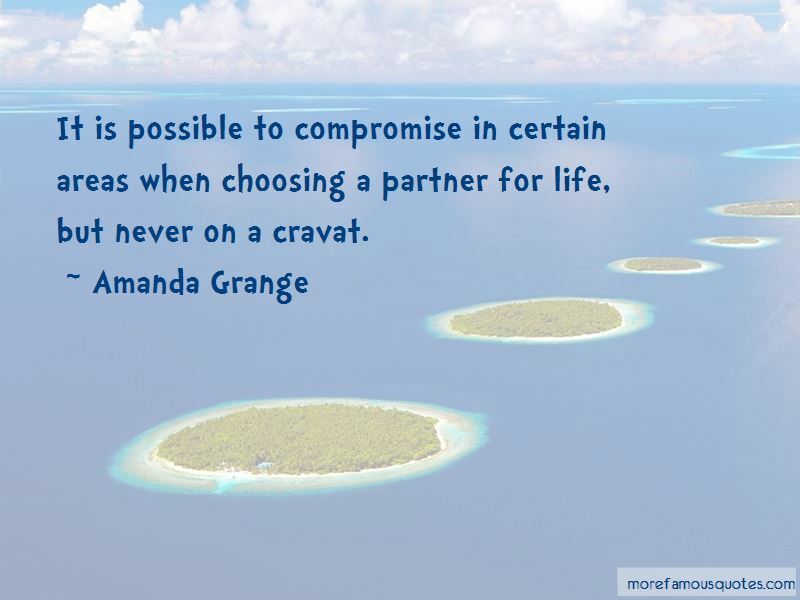 Enjoy the top 10 famous quotes, sayings and quotations by Amanda Grange. If we all spoke the truth there would be a great deal of unhappiness in the world, and particularly at such a time. Some things are better left unsaid. No", she wanted to say. " I don't want you to care for me, I want to be with my husband." But nothing came out. She turned beseeching her eyes to Darcy and she saw him as if from a great distance, through a distorting glass, but his words were firm and clear. "She has no taste for your company," he said. "No?" said the gentleman. "But I have a taste for her." Hers, thought Elizabeth. He should have said hers. "Let her go," said Darcy warningly. "Why should I?" asked the gentleman. "Because she is mine," said Darcy. The gentleman turned his full attention toward Darcy and Elizabeth followed his eyes. And then she saw something that made her heart thump against her rib cage and her mind collapse as she witnessed something so shocking and so terrifying that the ground came up to meet her as everything went black. “That I have not yet met the right woman, and that there is no use my marrying unless I find someone I like as well as Emma,' I said. A good turnout at church today. It had nothing to do with the mild weather and a desire to gossip and everything to do with my oratory skills, I am perfectly convinced. Indeed, if not for Mrs Attwood's new bonnet, I would have had the ladies' undivided attention. The gentlemen I was more certain of. They had no interest in bonnets, new or otherwise, and listened in pleasing silence, broken only by an occasional snore. Want to see more pictures of Amanda Grange quotes? Click on image of Amanda Grange quotes to view full size.